While featuring in the top ten for New Zealand, Samoans and Fijians are presumably in Other. New Zealand is the fifth most ethnically diverse country in the OECD, with 25% of the population being born overseas. And the above spread of ethnicities indicate to an extent the spread of ethnicities. 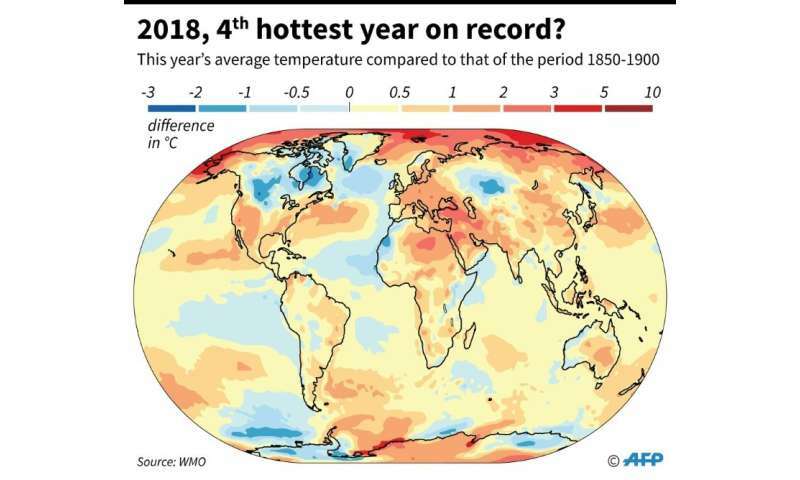 NIWA are set to release an analysis of last year’s weather records next week, but Jim Salinger has jumped the gun on them, unofficially stating the 2018 was the warmest year on record for New Zealand. Niwa isn’t due to release its official summary for the year until early next week, but Professor Jim Salinger has already picked it the warmest on records stretching back to 1867. His calculations put 2018’s mean annual land surface temperatures at 13.5C – or 0.85C above the 1981-2010 average. His figure also surpassed the scorching years of 1998 and 2016, which were 0.80C and 0.84C above normal respectively. Niwa meteorologist Chris Brandolino said people would have to wait until next week to see the climate agency’s final numbers – but added Niwa’s preliminary figures showed 2018 tracking extremely close to 2016’s record. So it looks like being one of the warmest years on record, if not the warmest. Fluctuations on that temperature record are to be expected, but an apparent surge trend over the last couple of decades could be a concern. New Zealand is just a small part of the world, but is not the only place to record a warm year – but not the warmest. So there will be ongoing pressure to try to reduce the human effect of warming, and to mitigate possible issues. Meanwhile, we have had a couple of weeks of generally very pleasant weather here in Dunedin, with a possible high into the thirties forecast for today. However this is just weather top enjoy (if you like 30+ temperatures, I prefer mid twenties. This summer might not be a record breaker, as a weak El Nino brings unsettled weather. We’re unlikely to get weeks on end of hot, dry weather, NIWA principal scientist Chris Brandolino says, but there’ll be periods of settled warm weather between blocks of cooler temperatures. This season the Pacific Ocean is signalling El Nino weather but the atmosphere is not, which makes it a “messy” driving force of the climate, he says, compared to when the two work in tandem. Temperatures are about or above average and rainfall is forecast to be around normal – other than a bit drier in the Upper North Island and wetter in the West Coast of the South Island. 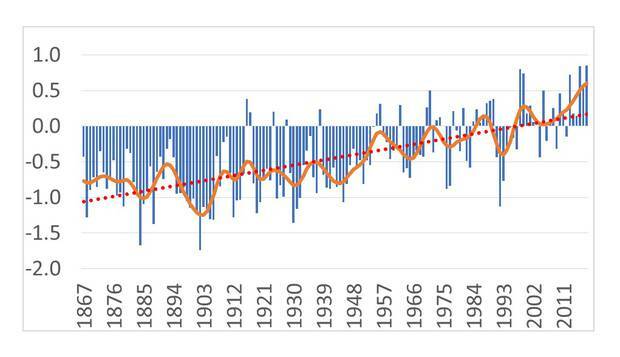 New Zealand is close to 1C warmer than a century ago. As the atmosphere warms it holds more water vapour, leading to heavier rainfall, Prof Renwick says. Along with rainfall extremes, more moisture in the air can lead to heavier or more unseasonal snowfalls. But with underlying temperatures getting warmer, heat waves are also more likely. Heat waves are rare here due to our usual weather variability. It was the year of #metoo, pay equity, and our Prime Minister becaming a mum. It was the year a female rugby player – at last – gained the sport’s top honour. It was the 125th anniversary of suffrage, a year of celebration. But also a reminder that change does not come without hard work and frustration. All year, we have watched as New Zealand women have fought for their rights. And fought. And fought. From campaigning against sexual harassment in the media, to arguing for equal pay through the courts, to addressing our shameful domestic violence record at the United Nations, women stood up and were counted. They raised their voices when others didn’t want to hear. They were empowered in the face of adversity. They persisted despite knowing meaningful change would likely be a long time yet. That persistence has led us to name women – all women – as our 2018 New Zealanders of the Year. However, we wanted to acknowledge a year which – though challenging – has been described by many as a beginning. Governor General Dame Patsy Reddy told us she thought the year was a tipping point, when women decided they’d simply had enough. Jackie Clark, who works with survivors of domestic violence, said it felt like a renaissance of the feminism of the 1970s. The only female chief executive in the NZX50, Chorus head Kate McKenzie, said she thought the year created momentum – and with it an opportunity to keep that momentum going. New Zealand is still a good place to be a woman, even if all our battles are not yet won. But what women have achieved this year marks 2018 as the beginning of an overhaul which will have a profound impact on future generations. It is a challenge to the future, rather than an answer to the past. Important change takes time, but 2018 was a good step forward for women in New Zealand. In his traditional Christmas Eve Mass, the Pope has urged people in the developed world to seek a simpler, less materialistic life and condemned the increasing gap between rich and poor. “Let us ask ourselves: ‘Do I really need all these material objects and complicated recipes for living? Can I manage without all these unnecessary extras and live a life of greater simplicity? '” Pope Francis said. “In our day, for many people, life’s meaning is found in possessing, in having an excess of material objects. An insatiable greed marks all human history, even today, when, paradoxically, a few dine luxuriantly while all too many go without the daily bread needed to survive,” he said. Somewhat ironic given the excessive opulence of St Peter’s Basilica and the Vatican. He didn’t say he would sell the huge gold candlesticks behind him and give the proceeds to the poor. Pope Francis, the first pope from Latin America, has made defending the poor a hallmark of his papacy. Another person who gets into a position of influence and power and talks the talk, but symbolises a walk in a different direction.